I’ve learned over time that work/life balance not only looks different for every person, but looks very different for an individual from one moment to the next. The needs you and your loved ones have and the things that give you the most pleasure can radically change over time. This year, I really tried to make more time in my life for reading. While reading helped transport me to other places when I was dealing with horrible work stress that no longer exists in my current (wonderful) job, I’ve found the practice of reading every evening psychologically beneficial. Reading centers me… puts me in a good mental space. I still have some nights when I’m so worn out I just want to watch guilty pleasure TV (and do), but I’ve found myself turning to books more often than not this year. Here’s a list of books I’ve read in 2015. The books noted with an asterisk were ones I couldn’t get through. Ones in bold, were books I REALLY enjoyed or found particularly moving (it’s hard to say you enjoyed a book that emotionally put you through the ringer). I put what I’d probably say was my favorite book read this year as the featured image for this post. This year, I’ve included some books that I read to my son, though only the long ones and only those we’ve read since summer. We are pretty religious about our approximately one hour of reading to our son each night (though now he has to do 15-20 minutes of reading to us as well), so we’ve covered a lot of territory over time. Getting into the Harry Potter books this Fall has been such a great pleasure for me (I’m the only one allowed to read those because my husband can’t do a British accent). It’s so fun to see the books through his eyes this time around. The Martian: A Novel – Andy Weir – a rare case where the movie was better than the book. Great story, but badly written IMHO. Americanah – Chimamanda Ngozi Adichie – I wanted to keep following the compelling story of the two Nigerian protagonists long after the book ended. Everything I Never Told You – Celeste Ng – about growing up under the weight of parental expectations. A tragedy. 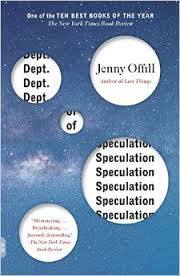 Department of Speculation – Jenny Ofill – a book that defies description. Almost stream of consciousness, but not in an artsy pretentious way. Matterhorn: A Novel of the Vietnam War – Karl Marlantes – this book shook me to my core. The Life Changing Magic of Tidying Up – Marie Kondo – a bit dogmatic, but my house is so much less cluttered and better organized now!!! Lean In – Sheryl Sandberg – I liked this much more than I’d expected to given that I don’t feel I really lean in. Our Souls at Night – Kent Haruf – I was so sad for it to end, knowing I’d never read another new book by one of my very favorite authors. RIP. ← Should the horrible first job search be seen as a rite-of-passage? I was very happy to see that I am not the only one who keeps a list of the books I have read. I am also glad to see that people still find time to read. More often than not when I speak to my colleagues they tell me that as teachers they just don’t have the time. I read daily because I believe it helps me mentally unwind at the end of a busy day. If you peruse my list you will not find any academic literature. I spent a lot of time during my undergraduate years (and I know I will spend even more time during graduate school) reading academic texts. As a result, I prefer to spend my free time reading what I love: thrillers, mysteries, horror, and the like. You will also see some children’s literature as I am helping students prepare for the Battle of the Books program. I also include the month the book was read in an effort to keep track of my reading habits, favorite authors, and to avoid reading the same book twice. I look forward to being a part of the conversations here.